Yesterday was a day where I was out of sorts for some unspecified reason. Drawing little, intricate bits of art was the only thing that helped to soothe me and calm me. Along with comfort eating, which was not good way to cope. I get days like this. I have no idea what triggered this response. It may have been a visit to my accountant on Tuesday and the tax bill to pay – I have absolutely nothing to worry about with either, but dealing with finances is a trigger for the anxiety and depression that are part of my cPTSD. I know I was on edge about the meeting, even though I knew there would be nothing to worry about. The anxiety had been gradually growing through the previous few days. This anxiety provoked the warning signs of an incipient migraine/stress headache on Tuesday morning. Luckily I caught it in time with painkillers so that it didn’t develop into a full blown migraine and after the meeting I was left tired but feeling more at ease. Yesterday, the anxiety ramped up again as I went to get the paperwork and bank card to make the payments. So, yesterday I needed to manage my anxiety and tiny, intricate drawings were what was needed. Today, I know I have to do these things, and I will. I don’t have the anxiety I had about them yesterday. I think yesterday was just too close to a few days of spiralling anxiety as accounts day approached closer and closer. cPTSD can make doing the simple things in life far more difficult to do. I do get things done, though I do have to be kind to myself at times, making sure I have plenty of time before the deadline. I used fountain pens on white paper to draw the designs. The M is on paper that is around 4″ x 4″, the G is a little narrower than 4″ for some reason. After scanning them in, I did a bit of digital wizardry to fill the letters with a gold foil texture, just to see what it would look like, and they look OK to me. I’m not too keen on the black line around the G though. I do like the contrast of the golden letters and the black and white designs around them. Today, I have to colour the cover for my next book for Dover Publications Creative Haven series. And keep warm and safe. I woke up to a lovely sunrise with a frosty world – everything was covered with white. I know the temperature was down to -3ºC last night as I came home around 10:30 pm, and it would only have got colder as the skies were clear and starry. It’s beginning to go now, but clouds have covered the sky. The frost is beginning to disappear now, but clouds have covered the blue skies. Snow is forecast for a bit later on today. I like to see snow. I like the way the world falls silent in heavy snow as it seems to muffle the usual background noise of modern times. I’m wise enough to know that for me to go out in snow is never a wise idea; I tend to slip and slide and fall and hurt myself. So, as I have nothing pressing that requires me to leave home, I’ll be staying safe and warm indoors! Once the cover is coloured, my attention will go to February’s templates for the Angela Porter’s Coloring Book Fans Facebook group. Someone there has asked for some simpler templates like my dangle designs, so I think that’s exactly what I’m going to do! Today’s hand-lettering is just a variation on the one I posted on Monday. For this one, I’ve used simple patterns to fill the white space in the letters and added a ‘line shadow’ to left and below the letters. To do this I used a Uniball Unipin 0.5 pen. I like the graphic nature of just black and white as well as the intricacy of the patterns.That intricacy is something that warms the cockles of my artistic heart. I didn’t only add details to the letters – I’ve added details to the dangle too! Simple additions but add a feeling of complexity. I feel at the moment I’m in a position both in terms of demands on my time but also in how I feel about myself and my artistic nature to explore hand-lettering so it’s an ‘Angela’ thing that I’m comfortable with. Not just comfortable, confident in my skills too. So, re-working a fairly open hand lettered word like this in different ways. So, it’s possible you’ll see variations on a word appearing on this blog, my Instagram, deviantART, Twitter and facebook accounts as time goes on. 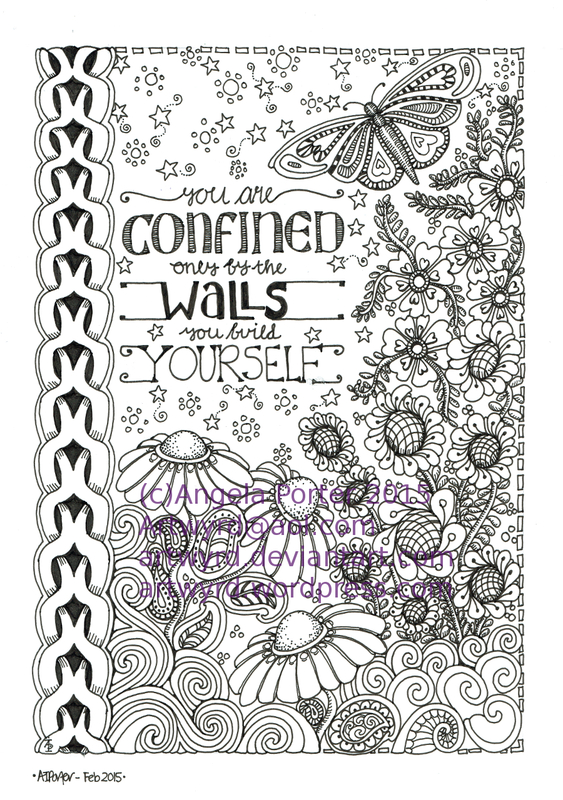 ‘freebie’ templates need to be designed for the Angela Porter’s Coloring Book Fans facebook group. I’m sure there’s some other things that need doing, but this morning they escape me. Of course I’m going to note these things in my BuJo. I’ll also be starting work on a new book for Creative Haven by Dover Publications. So a nicely ‘busy enough’ time ahead. Yesterday, I had a lovely day out to Aberglasney Gardens for lunch with my pal Liz. It was hammering down with rain during our journey there, but the rain cleared up by the time we’d finished a leisurely lunch. It had been many years since I’ve visited Aberglasney and I’d forgotten how interesting it is. I’ll return sometime soon with sketchbook in hand for sure! My evening and night until well past midnight were taken up designing a birthday card for someone. The design was finally uploaded to Moonpig ready for posting today near midnight. To say I was, and still am, shattered could be an understatement today! Still, I can have a semi ‘self-care’ day today to recover. Can you tell I’m really enjoying drawing intricate illustrations and designs at the moment? Pen and ink on paper, with pencil shading. Some dangles have crept in at the top, a touch I rather like. I meant to leave some space to add a quote or inspirational word, but got so engrossed in the dangles that I forgot! A Dangle A Day, Eerie Entangled Art and Entangled Butterflies are books of mine available to preorder now. Over on the Angela Porter’s Coloring Book Fans facebook group it’s work in progress wednesday. Pop over and you’d be made to feel welcome I’m sure!